The answer: Selfie hardware. The perfect selfie isn’t taken with a straight iPhone—you need extra boosters, such as fancy lighting, wireless remotes, and lenses for your iPhone’s front-facing camera, in order to master the selfie technique. The LuMee is so great, you’ll never want to take a photo without it again. 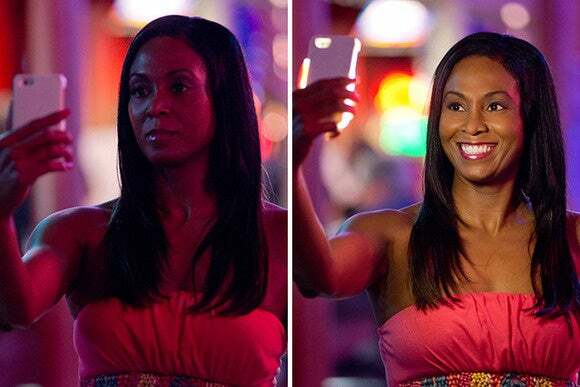 The key to a great selfie is great lighting. But unless you take your selfies in professionally-lit photo studios (I’m guessing you don’t), finding the perfect lighting is tricky. 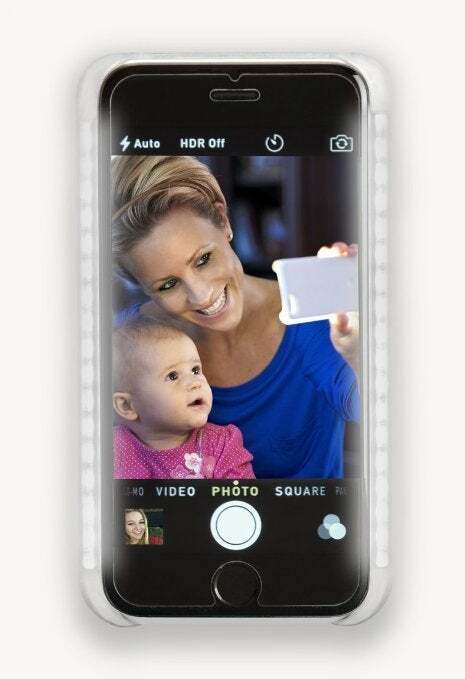 Enter the LuMee light-up case ($45; iPhone 6 and 6 Plus), a plastic hard-shell case with its own built-in selfie flash. Think bathroom vanity lighting, but in a good way. The LuMee has two bright but ultra-flattering strips of LEDs along its sides, so you can get that perfect soft glow every time. The case runs on its own battery (it recharges via MicroUSB) and has a button on the back that acts as a power switch and a dimmer—tap the button once to turn the LuMee on, and then press and hold the button to dim the lights (press and hold the button again to raise the lights). According to LuMee, the battery will last around two solid hours on full brightness and 36 hours on the lowest setting. Because I only used the LuMee for taking selfies, I was able to go around two weeks between charges. Top: No flash, no Lumee, no edits. Bottom: With the LuMee. Big difference (though you can update the orange tint with an additional fliter. 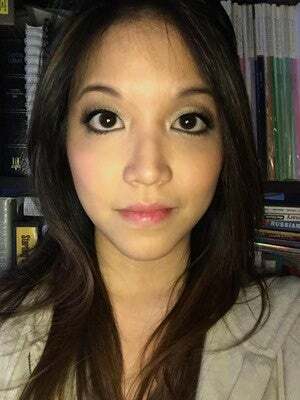 I love the LuMee’s warm light—it evenly illuminates faces for a nice, natural glow. As a selfie flash, the LuMee is excellent. The lights are bright, even, and warm (with a yellowish, as opposed to blueish tint), and they really do give you a vanity-lighting effect. If you use the LuMee as your only source of light (e.g. in a dark club), you may end up with an orangeish tint to your skin—but it’s nothing a good Instagram filter can’t fix. Once you put the LuMee on your phone, you won’t want to take it off—it’s that good. While it takes a little elbow grease to remove, it’s relatively easy to put on and take off, though if you find yourself removing your case frequently to use additional lenses or accessories (more on those in a bit), you might want to think twice about the LuMee. As a case, the LuMee is bulky and plasticky and not terribly fashionable, but you really can’t beat the selfie quality. And I’m not the only one who thinks so—the queen of selfies, Ms. Kim Kardashian West herself, was spotted with a LuMee at this year’s Grammy Awards. 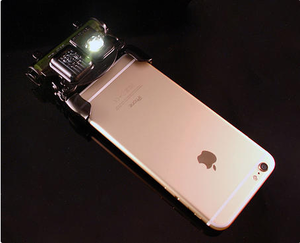 The Techzar TX6 attaches to your iPhone’s Lightning port to provide additional light. Techxar’s TX6 ($79; iPhone 6 and 6 Plus) is three things in one: A selfie flash, a rear-facing camera light, and a portable battery charger. 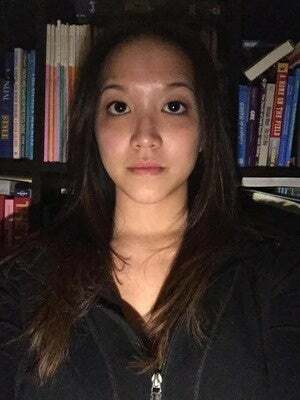 In other words, it’s like the LuMee, but it’s multi-functional and not a case (though it can be used with most cases, even the thicker-than-average LuMee), but in the world of selfies it does essentially the same thing—it lights up your face. The TX6 plugs into your iPhone’s Lightning port and has two clips that grip the side of your phone to steady it. On one side of the TX6, there’s a small strip of four warm LEDs that acts as a power status indicator (the LEDs light up in succession when you turn the TX6 on, to show you how much juice the device still has) and a selfie flash. The device is a little awkward to use, but gets the job done. On the other side of the TX6, there’s a bright camera light with an optional lens attachment (which diffuses the light—you can store the lens attachment on the side of the TX6). Both the selfie flash and the camera light are warm, dimmable LEDs, and to raise them you must press and hold the power button before you turn the light on. If you just press the power button once, the light will come on at full brightness; if you press and hold the power button, the light will start out dim and raise to full brightness. The TX6 has three buttons—one to power on the device itself, one to power/dim the selfie flash, and one to power/dim the camera light. The TX6’s light looks nice, but doesn’t display as evenly as the LuMee. Notice how it misses my face and hits my neck? While head-on, warm lighting is never a bad idea when you’re taking a selfie, but the TX6’s light isn’t quite as flattering as LuMee’s. Because its LED strip is considerably smaller, you get more of a directional light rather than even, vanity-style strip lighting. So you’ll end up looking more like a deer in headlights rather than Kim K on a good day—especially if you leave the TX6 in its place, plugged into the bottom of your phone. The good news is that you don’t have to leave the TX6 in place: You can unplug your phone and still use the light as a sort of directional spotlight from the most flattering angle. The problem with this is that now you’re using two hands to take your selfie: One to hold the light, and one to hold your phone, and this is considerably more difficult than it sounds. The TX6 is a bit bulky for an accessory, considering it doesn’t even stay attached to your phone. But it does pack a 2200 mAh battery, which will charge your iPhone about 1.5-times over—this makes it a lot easier to swallow as an accessory you can throw in your purse. The TX6 also has a rear-facing light, which is significantly more flattering than your phone’s built-in LED flash, so if you take as many pics of your buds as you do selfies... this may be the better choice. 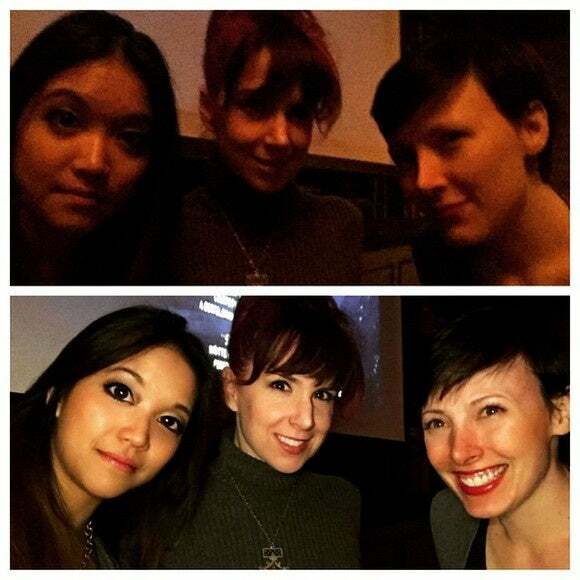 Lighting isn’t everything: Another key aspect to great selfies is distance. Face it: Facial texture isn’t super flattering up close, so the further you can get your phone away from your face, the more flattering (and less distorted) your selfie is likely to turn out. You can achieve this distance with a smartphone tripod, such as the Joby GripTight GorillaPod Magnetic XL ($40; iPhone 6 and 6 Plus). 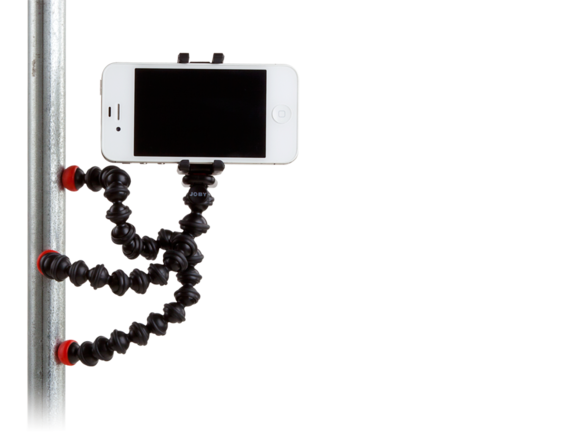 The GripTight GorillaPod Magnetic XL is a mouthful, but its description is in the name: This phone tripod “grips” your phone with a special GripTight mount, which then attaches to the GorillaPod Magnetic, a bendable tripod with strong magnets in its feet. 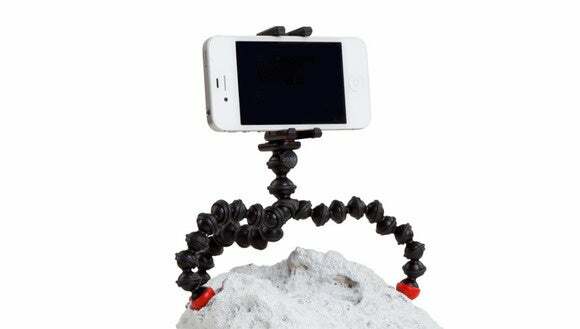 You can set up the GorillaPod Magnetic like a normal tripod with all three feet sturdily on the ground, or you can wrap its flexible arms around poles, lamps, fences—whatever happens to be in your area. 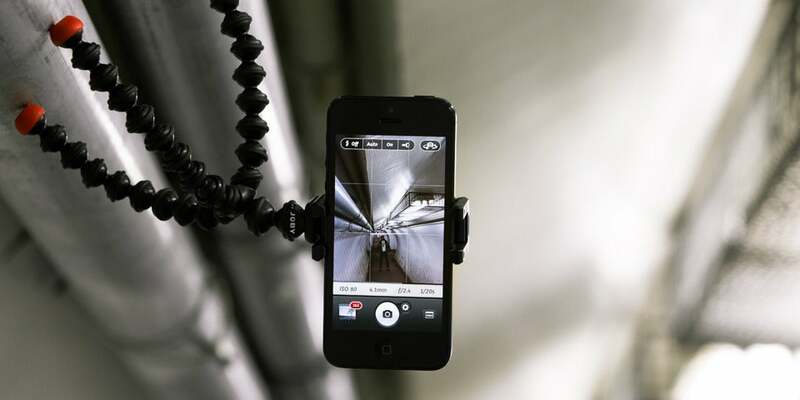 If you’re near a fridge or a metal fence, you can also just toss the GorillaPod Magnetic onto that surface (the magnets are very strong, and will even hold your phone upside down). ...or wrap it around something nearby. The XL grip is designed for bigger phones (such as the iPhone 6 Plus), but it’s also a good choice for people using bulky cases (it will also fit your iPhone 6 without a case, as there’s some overlap between the regular and the XL grip sizes). ...or stick it on to something magnetic. The GorillaPod Magnetic lets you set up your phone virtually anywhere, so you can get a selfie from more than an arm’s length away without resorting to a selfie stick. Of course, unless you manipulate the timer very well, you’re going to have to use some sort of remote to actually take the picture. Is a selfie only a selfie if it’s obvious that you’re snapping it yourself? Nah, not if you actually are snapping it yourself—even if your arm’s not in the picture. If you’re using a smartphone tripod or if you just propped your phone up against a pillow from across the room, you can still snap the picture from a good distance away using one of Gabba Goods’ #TheSelfie remotes (yes, the hashtag is part of the name). #TheSelfie Remote is wired and has a 4.5-foot range. 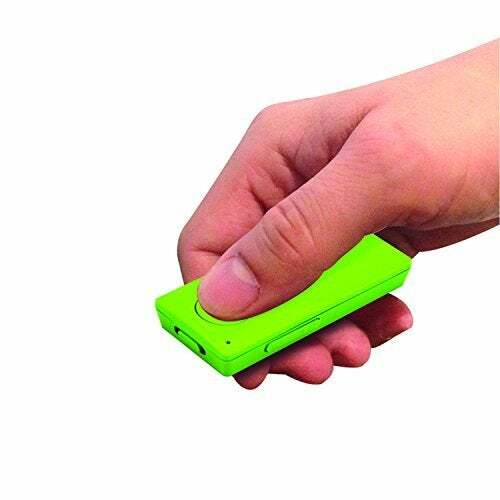 You have two options—#TheSelfie Remote ($20; iPhone 6 and 6 Plus), a simple, wired remote that plugs into your headphone jack and lets you take photos from 4.5 feet away; or #TheSelfie Bluetooth Wireless Remote ($30; iPhone 6 and 6 Plus), a watch battery-powered wireless remote that lets you take photos from up to 30 feet away and also doubles as a music remote for your device. The Bluetooth Wireless Remote gives you more range—30 feet. #TheSelfie Remote is super easy to use, and perfect for people who are looking for a literal plug-and-play device that’s, again, not a selfie stick. You don’t have to do any setup with #TheSelfie Remote—just plug it into your headphone jack, open your camera app, and start clicking away. #TheSelfie Bluetooth Wireless Remote isn’t quite as easy, since it’s a Bluetooth device that needs to be paired, but it’s still pretty easy: Turn it on (via the power switch at the top of the remote) and it automatically goes into pairing mode. Open up your Bluetooth menu, tap to pair, and you’re ready to go. #TheSelfie Bluetooth Wireless Remote has two buttons—one for snapping pictures and one to control your music (play/pause)—as well as a volume rocker on the side. No selfie hardware story is complete without a selfie stick—no matter how ridiculous they look in public (and yes, they do look ridiculous in public). 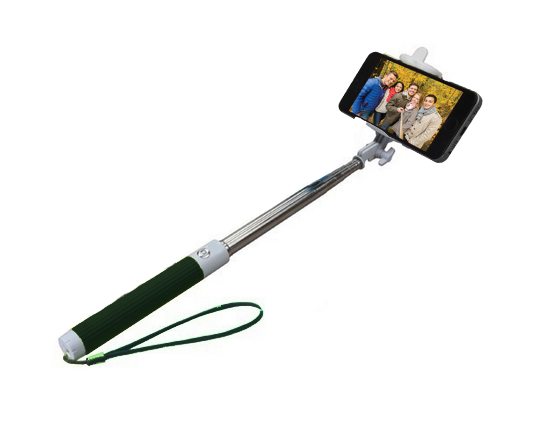 For this piece, we chose Gabba Goods’ #TheSelfie Stick ($30; iPhone 6 and 6 Plus), because it’s affordable, Bluetooth-controlled, and it comes in a variety of colors. For those of you who don’t know what a selfie stick is, it’s an extendable arm that lets you get a little extra distance in your selfies—basically, it’s like attaching your iPhone to a three-foot-long arm. #TheSelfie Stick has a grippy rubberized handle, a tight-grip holder for your phone (similar to Joby’s GripTight, but perhaps not as tight), and a metal extending arm that extends up to 36 inches, or three feet in length (when folded, it’s about 9 inches long). To connect it to your phone, all you have to do is press and hold the power button on the handle to put it into pairing mode. Once you’ve paired it with your phone, you can place your phone in the holder and start snapping away. 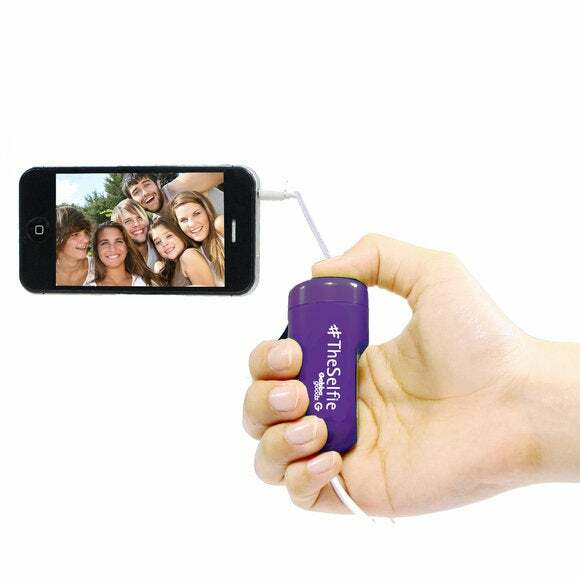 #TheSelfie Stick runs on a rechargeable battery (recharges via MicroUSB cable), and will last about three hours of continuous use. It’s not particularly pretty, but #TheSelfie Stick is good if you want to take a more flattering selfie (from above), if you have trouble extending your arm and taking selfies (it’s hard to tap the button when you’re straining to keep your phone away from your face), or if you want to get a good group shot. It does take a couple of tries to master taking a selfie without showing your selfie stick, but you’ll learn quickly. Maybe you don’t need a selfie stick to get everyone in the picture—maybe you just need a new lens. Olloclip’s 4-in-1 Lens ($80; iPhone 6 and 6 Plus) is a detachable camera lens that works with both of your iPhone’s cameras, making it perfect for creative selfies. 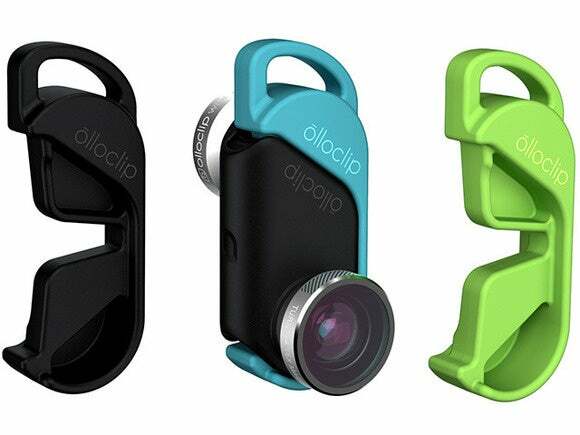 Clip the Olloclip lens onto your iPhone when you need it, and stash it when you don’t. The 4-in-1 Lens is—you guessed it—four lenses in one device: A fish-eye lens, a wide-angle lens, a macro 10x lens, and a macro 15x lens. For selfies, you’ll mostly be using the fish-eye lens and the wide-angle lens (trust me—macro on your face is not flattering). The fish-eye lens will give you a cool bubble effect that includes more of your surroundings (such as people) in the picture, while the wide-angle lens will give you a wider angle. 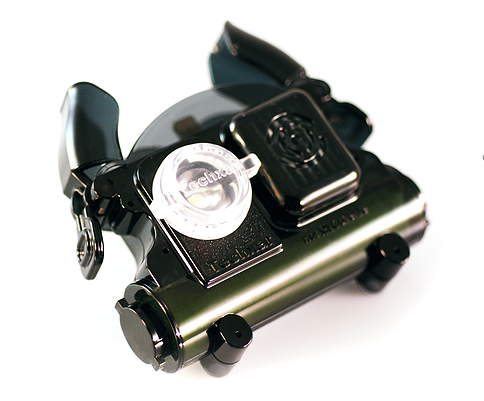 The 4-in-1 Lens comes with three interchangeable clips that you can clip onto a lanyard, your backpack, or somewhere in your car, so you have somewhere to store the lens when you’re not using it. Olloclip’s lenses work with both of the iPhone’s cameras. 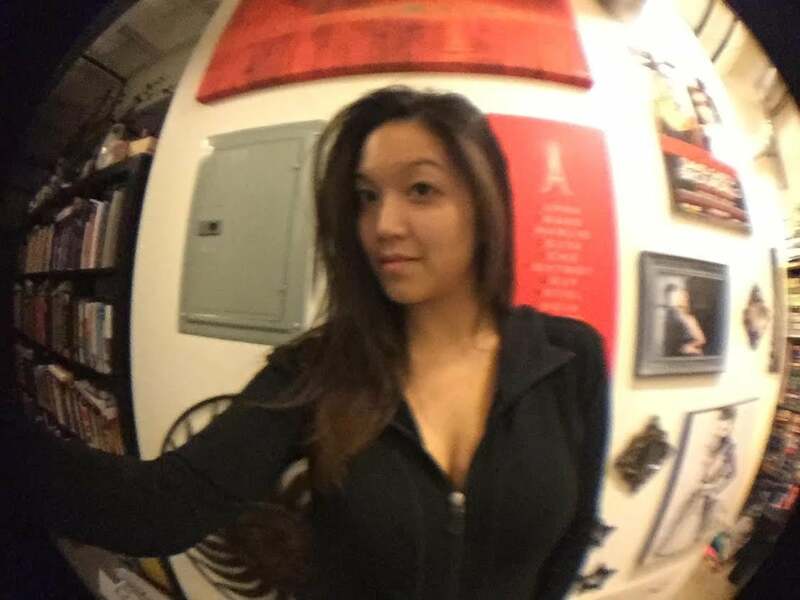 Here’s a selfie of me, taken with the fish-eye lens attached to the iPhone’s front-facing camera. The main drawback of the 4-in-1 Lens is that you can’t use it with a case—Olloclip is in the process of developing a slim-fit case that will work with the lens, but as of now you’ll need to take your case off in order to put the lens on your iPhone. What this means is that you can’t really use the lens with any case accessories, such as the LuMee—I started testing out the Olloclip and the LuMee right around the same time, and while fish-eye selfies are pretty cool, the LuMee is definitely more flattering. My dog, Blanka, loves being the center of attention. 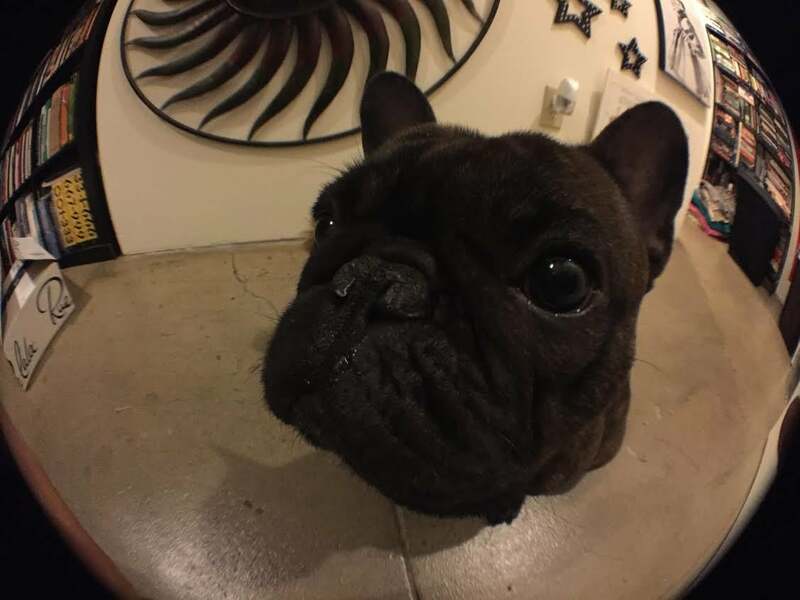 Here’s a snap of him, taken with the fish-eye lens attached to the iPhone’s back-facing camera (hence the higher quality compared to my selfie above). Of course, you don’t need to use all of these gadgets at once, but each of them can improve your snaps in a myriad of ways—any of them can help you reach next-level selfie status and boost your Instagram cred in no time.